The Formosan Termite A Formidable Foe! about 4 times actual size. Many are calling it the Second Battle of New Orleans, the first having taken place in 1815, when General Andrew Jackson's troops defended the city from the British. Today, the enemy isn't an army of redcoats, but an exotic insect, Coptotermes formosanus--a.k.a. the Formosan subterranean termite. The city's so-called Second Battle is actually the first leg of a new national campaign to rein in the tiny, ravenous pest. Originally from East Asia, the Formosan termite infests over a dozen southern states, costing an estimated $1 billion a year in property damages, repairs, and control measures. In 1998, the U.S. Congress took action--appropriating $5 million to fund the termite-fighting project, dubbed Operation Full Stop. It also appointed USDA's Agricultural Research Service to lead the campaign, which is taking a decidedly offensive approach to reducing large-area infestations of the pest. "Recognizing that the Formosan subterranean termite attacks any number of targets from the same colony, defending a single building, a single tree, a single location doesn't make a whole lot of sense, since they'll just go around it and continue to increase their numbers. You've got to shift to a large-area approach," says J. Patrick Jordan. 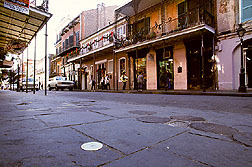 He leads ARS' Southern Regional Research Center (SRRC) in New Orleans, Louisiana, headquarters for Operation Full Stop, which officially kicked off April 27, 1998, in the city's French Quarter. To help wage a full-scale assault on the pest, Agricultural Research Service has formed a coalition of public and private groups that includes the New Orleans Mosquito and Termite Control Board, the Audubon Institute, USDA's Forest Service, Louisiana State University's (LSU) Agricultural Center, Texas A&M University, and the Universities of Florida and Hawaii. Jordon, director of ARS' Southern Regional Research Center, examine sticky traps covered with alates, the winged stage of the Formosan subterranean termite. Rather than rely on chemicals as the sole defense, the project's scientists are taking the offensive with an integrated pest management approach. One avenue of attack will begin in the laboratory as researchers look for ways to exploit weaknesses in the pest's biology, growth, chemical communication, and behavior. They'll also take the fight to the streets, so to speak, by setting out commercial bait products around buildings and in parks. 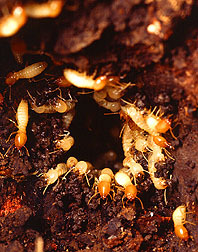 The baits work by luring foraging termites to bite off food laced with an insect growth regulator like hexaflumuron, which prevents the pest from molting. Because the bait's ingredients don't kill right away, the termite has time to carry the poisons back to the colony to share with its comrades. In Gainesville, Florida, ARS scientists are building computer-generated, geographic information system (GIS) maps. These will display numerous layers of information, such as street and building locations, geological formations, vegetation, and high-moisture areas. The maps will help authorities track progress of various control strategies. ARS researchers also plan travel to several East Asian countries in hopes of identifying beneficial organisms that naturally attack the Formosan termite. According to Jordan, nothing short of total war will curb the pest's numbers and spread. "You've got to go after the whole nine yards, if you intend to win," he says. "This is a major change in philosophy from previous attempts to stop these termites." Those are welcome words to June Cahn, a businesswoman who lives in the French Quarter--ground zero for Operation Full Stop. Like other residents, Cahn's all too familiar with the pest's costly mischief. Recently, her son James removed a beach-ball-sized nest from the walls of his home, a short walk from the famed French Market. "One of the things I've noticed about these termites is you don't necessarily know what they're doing, where they're showing themselves," says Cahn. "And by the time you find out, your structure can be turned to powder." In addition to wooden structures, the pest devours live deciduous trees and other woody plants. According to termite control board director Ed Bordes, about 30 percent of the city's live oaks and cypress trees are now infested. Even more frightening, this six-legged sneak is legendary for penetrating cement, brick, plastic, and other obstacles to get to food or water sources. A veteran of the Formosan termite war, Bordes has seen it all. "We've seen trees fall on trucks; we've seen trees fall on buildings--all infested with Formosan termites," says Bordes. "They'll eat the seals out of high-pressure water lines to get to the moisture inside." 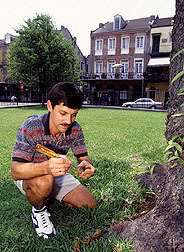 In May, Bordes joined a team of ARS and university scientists led by LSU Agricultural Center entomologist Dcnnis Ring to start a large-scale pilot study on a 15-block area of the French Quarter. With the help of residents and building managers, the scientists are evaluating use of two different baiting systems--one from Dow Agrosciences and the other from FMC Corp. They're also testing Premise 75, a nonrepellent soil termiticide from Bayer Corp.
at left, where the Louisiana Purchase transfer ceremony took place in 1803. The scientists are also installing monitoring stations. 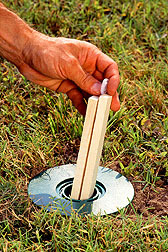 These devices contain two thin pieces of wood within a plastic tube that can be inserted in holes drilled into pavement or dug into the ground. 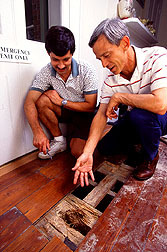 Later, they retract the wood to check termite activity. Smaller, site-specific projects led by LSU Agricultural Center researchers Gregg Henderson and Frank Guillot are under way at 15 schools plagued by the termite in Orleans, Jefferson, and St. Bernard Parishes. Another is planned for infested trees in Louis Armstrong Park. Bordes will oversee studies conducted at the 30-acre park located just north of the French Quarter. In these trials, scientists will evaluate and compare the performance of individual control tactics in an isolated setting, such as treating wood with borate and constructing physical barriers of fine-particle sand or stainless-steel mesh. They'll also examine construction practices that could minimize the ease with which termites gain access to a home via the soil. 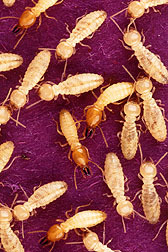 Most experts believe the Formosan termite invaded the United States half a century ago. "The theory is that it infested crates, pallets, and other packing material aboard ships carrying supplies and troops home from the Pacific Theater at the close of World War II," says microbiologist Alan R. Lax. He leads the SRRC's recently formed Formosan Subterranean Termite Research Unit. Those supply ships offloaded their cargoes in the coastal cities of Galveston and Houston, Texas; Lake Charles and New Orleans, Louisiana; and Charleston, South Carolina. Inevitably, the used crates and pallets ended up in landfills, often buried in soil--an ideal environment for these subterranean termites, says Lax. Still, it wasn't until the mid-1960s that scientists discovered the unwelcome stowaway at these points of entry. Why the 20-year delay? "The Formosan termite was unknown in the States before that time, and populations were low," explains Lax. "The pest's winged stage also resembles a commonly occurring drywood termite, which may have created some confusion." Eventually, it became obvious this was no native. Formosan termite colonies dwarf those of native species, covering far more terrain and numbering many times more members. Although it took time for it to establish itself and spread, the Formosan termite has done so with startling success. Today, it infests Alabama, Arizona, Arkansas, California, Florida, Georgia, Louisiana, Mississippi, New Mexico, North and South Carolina, Texas, and Virginia. Hawaii is a separate story: That state's infestations date back far earlier. For years, pest control operators fought a delaying action with chlordane, an insecticide thought to remain potent in soils for up to 25 years--one trait that proved the chemical's undoing. 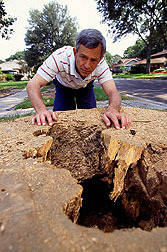 In 1988, concerns over the chemical's risk to both the environment and human health led to the loss of chlordane, exacerbating the Formosan termite problem. Other compounds used since then have lacked the same staying power. The termite, however, has plenty of staying power. In fact, it is now so well established and widespread, experts say eradication is not a likely scenario. "One of our initial goals is to eliminate colonies and the damage they cause within defined treatment areas," says Edgar G. King, associate director for ARS' Mid South research area, headquartered at Stoneville, Mississippi. "We're evaluating the best technologies available now and assembling them into a package the pest control industry can use," says King. Thus armed, public or private pest control operators could then begin the task of attacking termites that bedevil a particular city or state. A chief reason for Operation Full Stop's starting with New Orleans is that the city has fallen prey to one of the largest and most destructive Formosan termite infestations. "We're estimating that we're losing about $300 million a year in the metropolitan area to termite damage and control costs," says Bordes. of the heaviest Formosan subterranean termite infestations in the country. Here, a tamper-proof metal cap in the street marks the location of a monitor/baiting station in an area that is already under treatment. A humid, near-tropical climate contributes to the problem. 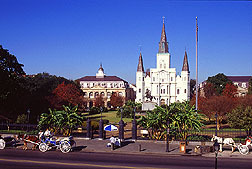 Another factor is the architectural character of the city's French Quarter. Many of the buildings there are historic landmarks with foundations supported by woodwork dating back to the 1700s in some cases. Consider, too, the row-style homes. Their shared walls give foraging termites easy access from one building to the next. This hampers pest control efforts to treat or fumigate a single client's home or building. "Formosan termites have definitely changed the way pest control operators do their business," says Edward Martin, who is with Terminix, Inc., of New Orleans. "They are extremely strong survivors," says Martin of the pest. "So even if they are cut off from the ground--if you've trapped hundreds of thousands of termites in the building--there's a good probability they will find some minuscule moisture source and build a nest right in the building." Detection, he adds, is the key. "I think that since we've come in with the bait systems--which seem to be working very well--we have the ability to reduce these colonies. But if we can't find them, we can't bait them." 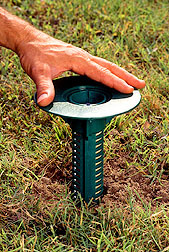 is being installed in a grassy area. That's something Operation Full Stop scientists aim to remedy. They are establishing collaborative ties with National Aeronautics and Space Administration and U.S. Department of Defense researchers to devise sensing techniques to find termites hiding within walls and other hard-to-reach places. The standard approach is to visually inspect a structure. With help from the defense or space industry, tomorrow's tools of detection might instead rely on electrical current, acoustic sound, infrared light waves, or some other as yet untapped technology. Equipped with such early warning systems, "we could apply an offensive strategy to eliminate the invading termites before they do substantial damage," says Lax. SRRC scientists are also working closely with LSU entomologist Henderson and colleagues to decipher the pest's chemical communication. They hope to synthesize chemical come-hither signals that the termites use to attract fellow termites to food sources and other locations. These signaling chemicals could be used to make toxic baits even more irresistible--and deadly. The university group has also shown that aspartic acid, a natural chemical in sugarcane, whets the Formosan termite's appetite. 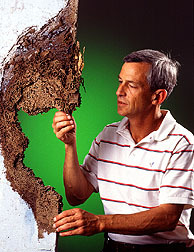 "A large part of our research is to look for ways to modify termite behavior," says Henderson. "Termites orient to chemicals. So we want to find the chemicals they are using and then try to use them against the pests, both as feeding stimulants and attractants." Similar work is under way at the University of Florida in Gainesville. There, Operation Full Stop collaborator Nan-Yao Su is studying the termite's behavior and colony dynamics. 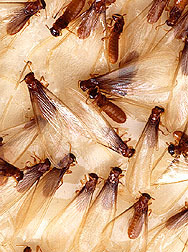 Like ants, termites are social insects with a caste system that includes workers, soldiers, and alates, the winged forms that become the kings and queens. Queens can lay 2,000 to 3,000 eggs a day. Exploiting the Formosan termite's nutritional needs is one focus of the new SRRC research unit. "We anticipate making improvements in the baits, composing them out of food sources that are essential for termite development--the right ratio of carbohydrates, amino acids, fatty acids, mineral salts, and vitamins," says Lax. "We want to make formulations that are absolutely irresistible to Formosan termites, so they'll have no choice but to take the bait--and the toxin that goes along with it." Ken Grace, a University of Hawaii entomologist, is working to identify the termite's favorite native species of trees and plants and those it avoids. The bad-tasting plants may contain signaling chemicals that deter the termite from feeding and could become part of new, biologically based pesticides. Roger Gold, a Texas A&M University professor at College Station, is studying termite biology, reproduction, and foraging behaviors. Of chief interest: the symbiotic relationship between the termite and protozoa that reside in its hind gut. There, the microbes supply their insect host with enzymes for digesting cellulose. Gold envisions a form of microbial sabotage in which tricking the termite to ingest low doses of certain chemicals would kill its protozoan partners. Starving the pest by this method, Gold notes, "is quite a few years off." Janine Powell works with the ARS Biological Control and Mass Rearing Research Unit at Mississippi State and the ARS Quarantine Facility at Stoneville. Powell's charge is to coordinate research to find, collect, and import the Formosan termite's natural enemies--whether they are predatory insects, parasites, or fungi that infect and kill the pest. If such organisms exist, scientists will return with specimens for study under quarantine conditions at the Mississippi labs. If these natural enemies pass muster on a rigid environmental safety checklist, scientists would place them on active duty in termite-infested regions of the United States. Entomologist Rick Brenner at ARS' Center for Medical, Agricultural, and Veterinary Entomology at Gainesville is leading research to harness the GIS maps, along with Global Positioning System technology. Scientists will use these high-tech tools to monitor the termite's spread, colony growth, foraging patterns, and proximity to moisture sources. By illustrating areas of interest, the GIS maps will help scientists identify termite hotspots where baits or other controls would be most effective. The SRRC is both research institution and the hub around which Operation Full Stop scientists coordinate their studies and communicate findings. The center also works closely with New Orleans' Audubon Institute, which fills a vital educational role in enlisting public support and participation on the project. 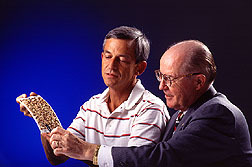 In late 1999, the center plans to host an international conference to report on the campaign's progress, as well as to highlight research results from around the world. With New Orleans as the proving ground, Operation Full Stop will eventually expand to other states or cities under siege by the Formosan subterranean termite. If unchecked, scientists fear the pest will extend its range, perhaps along the coastal states of the North or West. In this sense, Operation Full Stop is a good national insurance policy. In the words of French Quarter resident June Cahn, "You would do very well in settling the question down here before it gets to you." --By Jan Suszkiw, Agricultural Research Service Information Staff. J. Patrick Jordan and Alan R. Lax are at the USDA-ARS Southern Regional Research Center, 1100 Robert E. Lee Blvd., P.O. Box 19687, New Orleans, LA 70179; fax (504) 286-4234. "The Formosan Termite A Formidable Foe!" was published in the October 1998 issue of Agricultural Research magazine. Click here to see this issue's table of contents.